As it always does, this year’s Masters brings a great deal of intrigue. And as we look towards the 2019 Masters, a number of questions must be asked. In recent years, Augusta has been kind to golfers looking for their first major championships. Will that continue or is this finally the year for Rory McIlroy to join golf’s most elite club? Is it time for Tiger Woods to reclaim the place he once so frequently held in majors? Can Brooks Koepka or Francesco Molinari keep the form that we saw through the summer of 2018? There are a number of questions to ask as we look towards the 2019 Masters. These are the most pressing among them. Will we see another first-time major winner crowned? The trend of the recent major championships has been positive for players looking for their first triumph. Ten of the last 13 winners have been first-time champs. Each of the last four winners at Augusta have been first-time major winners. So, who might keep that trend going this year? Bryson DeChambeau, Jon Rahm, Rickie Fowler and Xander Schauffele are all Top-10 in the World Rankings and looking for their first win. Five other golfers in the Top-20 have yet to win a major. A number of dark horse contenders exist, as well. So, 2019 doesn’t lack for candidates. Can Patrick Reed join the elite club? In total, 17 men have multiple Masters wins. Many golfers who can join that club in 2019. But Reed is the only man with a chance to join the really select group of back-to-back winners. It’s a group that includes only Nicklaus, Nick Faldo and Tiger. Unfortunately, Reed hasn’t been in top form over the last year. He hasn’t won since the 2018 Masters. He did finish in fourth place at the U.S. Open. But since, he has nearly as many missed cuts (three) as top-10 finishes. In order to join that group, Reed will need to turn things around. Does Franceso Molinari keep his hot streak going? Molinari finished T20 at the Masters last year. When the week was over, he was ranked No. 29 in the world. Since then, he’s won four times (including the 2018 British Open), posted five other top-10 finishes, and moved up to No. 7 in the World. He also went 5-0-0 at the Ryder Cup, for good measure. Augusta hasn’t always been Molinari’s bread and butter. He’s never finished better than T19 at the Masters. But he’s coming in playing some incredible golf. This is a golden opportunity for Molinari to reverse that trend. Will a great Augusta record help Jordan Spieth rediscover his form? The 2018 Masters perfectly represents Spieth’s recent struggles. Spieth’s best three rounds were actually one shot better than Reed’s. Unfortunately for Spieth, when we add each man’s worst round in the mix, Reed bested Spieth by two shots. We’ve seen some great play from Spieth since the 2017 British Open, when he last won. We’ve also seen a great deal of inconsistency. The good news for Spieth is that at the Masters, he has a win, two second-place finishes, a third-place finish, and a T11. This is as good a place as any for him to turn it around. Will Justin Rose solidify his No. 1 ranking? Rose, Dustin Johnson, Koepka and Justin Thomas have all held the World No. 1 ranking at some point over the last year. Rose holds the No. 1 ranking heading into the Masters. He’s finished in the top-25 at Augusta in each of the last eight years. Two of those were second-place finishes. Part of the reason for the hot potato in the rankings is that nobody has done a heck of a lot to keep the ranking upon grabbing it. If Rose can knock down the door he’s been pounding on for nearly a decade, he’ll change that. Can Rickie Fowler take that one final step? As previously detailed, Fowler is one of several top-tier golfers looking for that elusive first major win. But his plight is a little more notable. First of all, Fowler has nine top-10 finishes in majors. All but one of those was a top-five. One near miss came a year ago, when Fowler finished only one stroke behind Reed. Since then, Fowler has a win, eight top-10 finishes, and only one missed cut. He doesn’t have a major championship yet. But based on the form we’ve seen over the last year, that can change soon. Does Brooks Koepka continue his major dominance? Koepka missed the Masters in 2018 with an injury. His best finish at Augusta came a year before that, when he finished T11. Since then, a lot has changed for Koepka. He won the U.S. Open in 2017 and 2018 (becoming the first man in nearly 30 years to repeat) and added the 2018 PGA Championship for good measure. Should Koepka win the Masters he’ll be on the brink of history — needing only the Open Championship to complete the career Grand Slam. It would also be another notch in one of the best major championship runs that we’ve ever seen. Can Dustin Johnson add another major? As much as DJ has accomplished in his career, his major championship resume is a little light. Only one of Johnson’s 22 professional wins was a major. Beyond that win, Johnson has 14 top-10 finishes in majors. Six of those were top-five finishes. So, he’s had his chances. There’s definitely a comfort level with the course. Johnson has finished in the top-10 in each of his last three trips to the Masters (remember, he had to withdraw in 2017). Augusta really is set up for a guy like DJ to succeed. He just needs to put the rounds together. Will Rory McIlroy finally complete the Career Grand Slam? McIlroy held the 54-hole lead in 2011 at the Masters and has finished in the top-10 in each of the last five years. What we haven’t seen him do is win. We saw the final round collapse in 2011. We saw McIlroy fail to really challenge Reed in 2018’s final pairing. But if McIlroy can get that monkey off of his back and earn his first Green Jacket, he’ll join Gene Sarazen, Ben Hogan, Gary Player, Nicklaus and Woods as the only men to win the modern Career Grand Slam. Golfers don’t come much more celebrated than that. 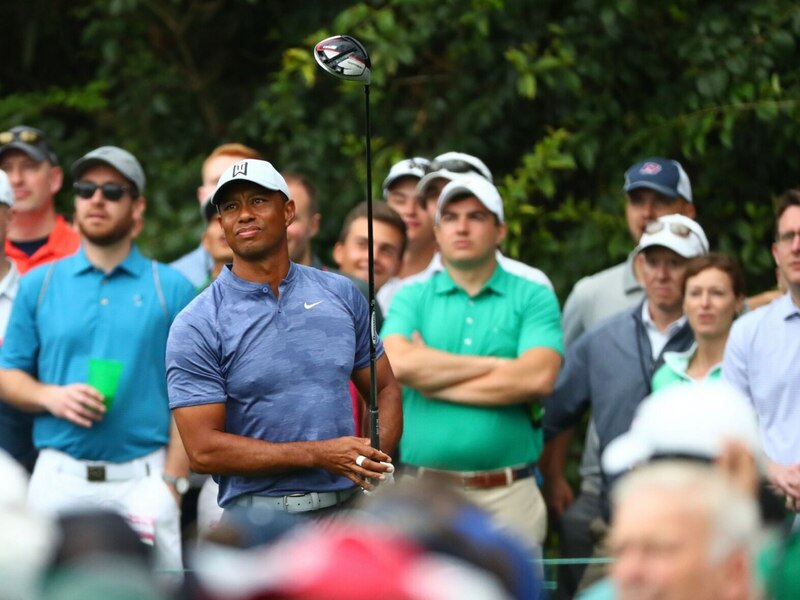 Is Tiger Woods finally ready to win another major? Augusta has always been good to Tiger. He has four wins, nine other top-10s, and has never finished worse than T40 as a pro. Woods is 43 now. So if he’s going to really pursue Nicklaus’ major record, he needs to start winning majors again soon. Winning four more to equal the record may not be likely. But after a great revival season in 2018 — which included a T6 at the British Open, a runner-up at the PGA Championship, and a win at the TOUR Championship — it doesn’t seem impossible, either. A win would make it seem even more likely.